One may think that the Nokia Lumia 920 is the most exciting Windows Phone 8 device of the moment, but does anyone remember the very first WP8 model? Announced at the end beginning of the fall, Samsung Ativ S was actually the very first Windows Phone 8 model, before the HTC and Nokia Lumia units. It has arrived to us for testing purposes and we had fun with the prototype. Sadly, the prototype phase meant that the device was prone to some bugs, like a camera button that didn’t always feel right or some apps that feel laggy. The device is priced at around 450 euros and its design is actually sexier than the one of the Galaxy S III, although the two look pretty much alike. This prototype is a 4.8 inch smartphone with the general design lines fitting the S III, but a more serious approach, with less curves and certainly a less slippery case. The back cover feels like metal and almost acts like metal, but it’s a faux metal plastic material, that does a fine job at protecting the insides of the smartphone. The cover is easy to remove, but pretty hard to put back in the same position we found it. 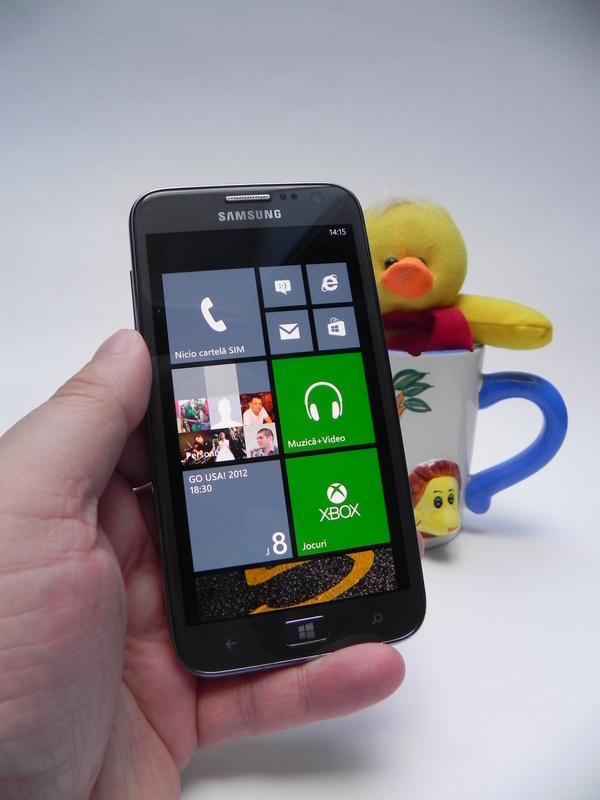 Samsung Ativ S measures 8.7 mm in thickness, weighs 135 grams, which is 50 grams less than the Nokia Lumia 920, a reason to appreciate the Samsung model more. We’ve also got a microSIM card slot on board, a microUSB port, audio jack, volume buttons and a camera button. The handset is mostly plastic and sits well in the user’s hand, without problems. The chrome frame around the screen gives it a bit of extra ellegance. Upfront, above the screen we’ve got the earpiece, proximity sensor and ambient light sensor, plus 1.9 megapixel front camera. Also at the front, in the lower area we find a solid Start button and next to it the Back and Search button. Under the hood of the smartphone we find a 2300 mAh battery and other hardware features include a secondary microphone on top. Powering up this phone is a dual core 1.5 GHz processor, a Qualcomm MSM8960 Snapdragon chipset, with Adreno 225 GPU and the display on the Ativ S is a Super AMOLED 4.8 inch screen with a 1280 x 720 pixel resolution. The display is protected by Gorilla Glass 2 and has 306 ppi pixel density. This Samsung smartphone also offers 1 GB of RAM, 16/32 GB of storage, HSDPA 42 Mbps connnectivity, WiFi, Bluetooth 3.0 and NFC. At the back there’s an 8 megapixel camera, with autofocus, LED flash, geotagging, image stabilization and 1080p 30 fps video capture. Hardware also includes an accelerometer, gyroscope, compass, GPS, Glonass and for some reason, no FM radio. The battery of the Samsung Ativ S offers about one or two days of use, which is pretty decent, by modern standards. Moving on to the video side, we tested a trailer of Paranorman, that showed us good blacks, good colors, that are nicely saturated and the handset offers the ability to play 1080p video without hassle. Brightness is good, but below the standars of the Galaxy S III and another good thing about the display is the low reflectivity, that translates in good behaviour in direct sunlight. Finally, this Pentile Matrix screen also has good viewing angles. On the audio side, we’ve got a huge volume and this is one of the loudest phones I’ve ever listened music on. Bass is good, but at maximum volume distorsion appears. The headphones bundled with the device are excellent and the main downside to the audio experience is the lack of equalizer in Windows Phone 8. As far as camera goes, the 8 megapixel sensor is supposed to be the same as the one on the Galaxy S III, but it’s nowhere near that good. Of course these could be prototype problems, but we had trouble with pressing the camera key and we were underwhelmed by the quality of the pics. We liked the Lenses system that adds more filters to the camera app and also the video capture was pretty good. I also noticed that the pictures have a very reduced level of noise. You should know that video captures result in MP4 files with 21 Mbps bitrate. Moving on to the OS, we dedicated a separate review for that, but you should at least know that the multitasking is done by keeping the Back button pressed and swiping between apps. Internet Explorer 10 feels pretty fast and you’ll get used to the browser bar being on the lower side of the screen fast. The benchmark results in Sunspider actually show that IE 10 is faster than the Safari on the iPhone 5, by about 100 ms or less. Another good thing is that Zune is dead and you can connect your Ativ S to the PC as a normal drive. The People Hub gets Rooms in WP8, a way to group close contacts, with your own threads and lists. Samsung Ativ S offers great call quality and noise cancelling and has VoIP integrated into the experience as if it were a normal phone call. We also get NFC and Wallet feature, plus Bluetooth transfers. We even have a voice companion available, called Tell Me, that’s light years away from Siri and Google Now. At least it can open up apps and search locations for you on the map. Speaking of Maps, the experience they provide is way too simple and lacking many features. It may be Nokia technology, but where’s my turn by turn navigation and some POIs in my region? Samsung also included here some special apps that they’re responsible for: Family Story, Mini Diary and Music Hub. There’s also their photo editor, with the same cool features from the Galaxy S series. Chaton is also here, as well as Data Sense, a new feature in WP8 that allows you to monitor your data usage. And now it’s time for the pros and cons related to this model. We give the device a 9.2 for the design, an 8 for hardware and 7 for the OS and UI, for a total of 8.06 out of 10 and we’re highly indulgent here. The handset has a lot of potential, but it feels rushed and unfinished in some areas. What I can guarantee is that the next Samsung Windows Phone 8 device will be a gem, first in design and maybe then in software. Till then this is all we had to say about the Ativ S.